Monitor Audio enters the soundbar sector with £1000 ASB-2 | What Hi-Fi? Now we could have done with this for the luxury soundbar test in our current September 2013 issue of the magazine. Monitor Audio is the latest hi-fi company to join the likes of B&W, Sonos and Yamaha in targeting the more upmarket soundbar market. The Monitor Audio ASB-2 will go on sale this September for £1000. 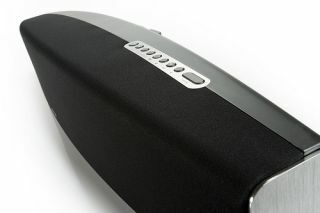 Its maker says the device "combines a high-performance active audio system with the latest wireless streaming technologies in a single, beautifully engineered design". At just over a metre wide, it can handle the sound from TVs, Blu-ray and DVD players, set-top boxes and games consoles via one of three HDMI inputs. There's also an HDMI output for 1080p/3D video passthrough, which has an Audio Return Channel (ARC) for the two-way transfer of data between the soundbar and a compatible device. Additionally, there are optical and coaxial digital inputs, plus analogue RCA inputs for conventional hi-fi components such as a CD player. If you want more bass, there's a single RCA LFE output, with automatic crossover filtering,for adding an external subwoofer. And with Apple AirPlay, UPnP (Universal Plug and Play) and DLNA (Digital Living Network Alliance) compatibility on board, streaming music from your Mac, PC, smartphone or tablet should be simple. Network set-up is via wi-fi or USB. There's even AirPlay Direct for those who want to connect to the ASB-2 without access to a local network. As for sound, five discrete power amps deliver a total of 160W (claimed) to six proprietary C-CAM drivers: two 5.5in bass drivers, a pair of 4in C-CAM midrange drivers and two 1in C-CAM tweeters. The ASB-2 can accept 7.1-channel soundtracks and processes them to deliver left, 'virtual centre' and right audio, with rear channels generated by applying crosstalk cancellation processing. If you turn off the 3D processing, the soundbar becomes a three-way stereo music system. Finished in black grille cloth with solid, brushed metal end trims, the Monitor Audio ASB-2 can be placed on a rack or cabinet, or wall mounted using an optional fixing bracket.